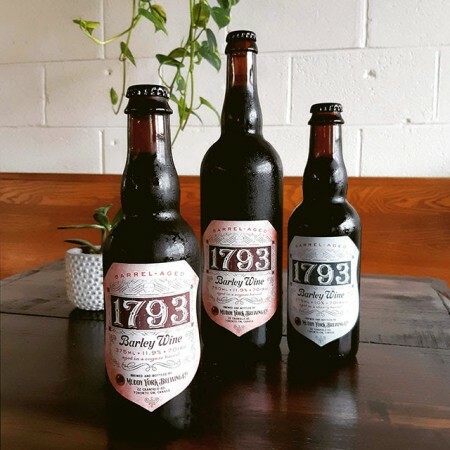 TORONTO, ON – Muddy York Brewing has announced the release of two barrel-aged variants of 1793 Barley Wine, which is named in honour of the year that Lieutenant-Governor John Graves Simcoe established the city of York as the temporary capital of Upper Canada. Smelling of raisins, cinnamon, and cognac, and pouring a deep amber colour, Cognac Barrel-Aged 1793 Barley Wine (11.9% abv, 70 IBU) appears soft, mellow, and slightly boozy on the tongue, with a rich body, notes of toffee, oak, and dried fruit. It finishes dry and clean with a faint bitterness. Sherry Barrel-Aged 1793 Barley Wine (10% abv, 70 IBU) brings together the classic toffee, bitter orange, and dried fruit notes of barley wine with the bone-dry, citrus, dried-grape, and fruit blossom notes of the Tio Pepe Sherry barrel it was aged in. Both editions will be released tomorrow (Thursday October 4th) at Muddy York in 375 ml bottles. A small quantity of the Congac edition is also available in 750 ml bottles, with a limit of 1 bottle per person while supplies last.